Kids receive place-mats with games and a coloring contest. We select winners each month where your child can win a free kids meal. 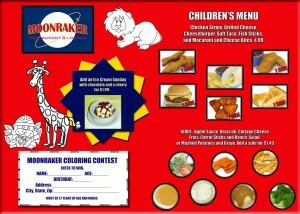 Take a look at our great kids menu. View our kids menu. Don’t forget to have your child enter our coloring contest. We select winners each month to receive a free kids meal. Enter our birthday club for a sweet treat. Give us your name and birth date to receive a FREE ice cream sundae on your birthday. Celebrate your birthday with us.